LASIK | Camas Optometrist | Dr. Scott Lewis, O.D. Dr. Lewis has spent many years working at a busy Lasik center, and has seen thousands of pre and post-operative Lasik patients. He has trained many new optometrists in the preoperative and postoperative care of laser vision surgery patients. 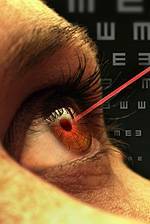 If you are interested in Lasik, Dr. Lewis can discuss your candidacy for the procedure at the time of the exam. An instrument called a microkeratome is used in LASIK eye surgery to create a thin, circular flap in the cornea. Another, newer way of making the flap is with a laser called Intralase. Intralase Lasik, which is also known as “All-laser Lasik” or “blade-free” Lasik is now considered by most to be the most safe and precise way to create a corneal flap. After the flap is created, the surgeon folds the hinged flap back out of the way, then removes some corneal tissue underneath using an excimer laser. The excimer laser uses a cool ultraviolet light beam to precisely remove (“ablate”) very tiny bits of tissue from the cornea to reshape it.